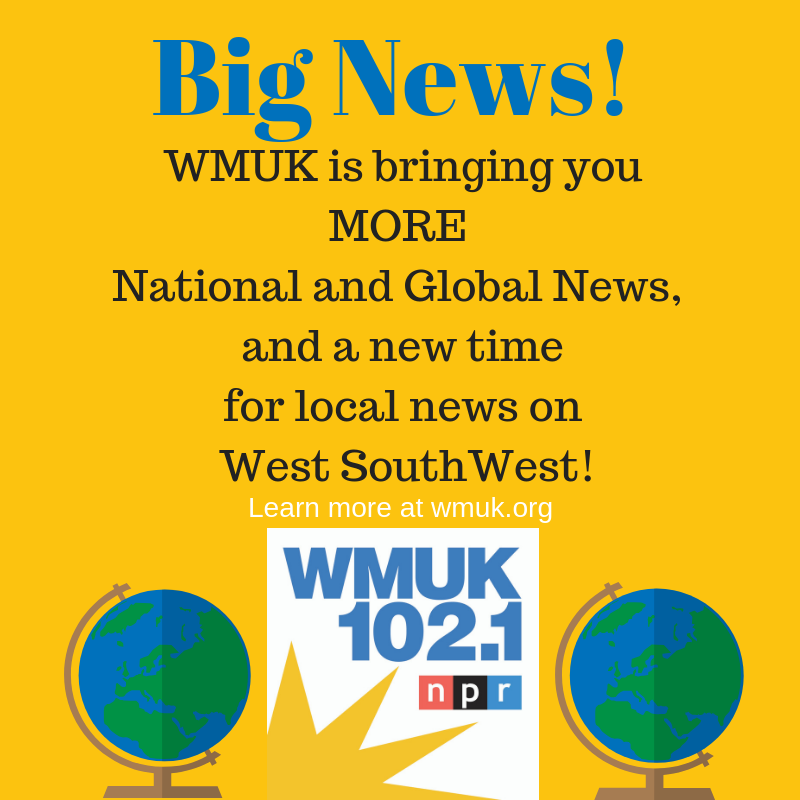 WMUK 102.1 FM is excited to expand our national and international news programs during the Monday – Thursday schedule starting Monday, January 7, 2019. The goal of this change is to offer local news and information at more convenient listening times throughout our national and global news broadcasts. What does this mean for my listening schedule? Mondays through Thursdays, you’ll hear Morning Edition from 6:00am – 10:00am. You’ll also hear a full hour of the BBC News from 3:00 – 4:00pm. Our Friday and Weekend schedules will remain unchanged. However, New Letters on the Air and With Good Reason will be removed from WMUK’s regular schedule to accommodate the news expansion. Why is WMUK making this change? WMUK is a charter member of NPR, whose mission is to “build a more informed public.” We are committed to that very same mission, and we’re working on providing the most comprehensive news and information to listeners across southwest Michigan and northern Indiana. Many of our listeners have told us that they’d like us to feature more news. And we are listening! If you have more feedback, please reach out! We’re excited to try this, but we also know that, if it doesn’t work, our staff is ready to adjust so that we can better serve you. What is happening to WestSouthWest? WMUK’s news team will bring you concise WestSouthWest Brief stories on Mondays and Thursdays during Morning Edition and All Things Considered. Tune in at 7:34am, 9:34am, and 4:20pm for the same great content you rely on! Our news team is still going to conduct extensive interviews and put together full-length WestSouthWest programs, which will be available on our website and on our app. Where can I find New Letters on Air and With Good Reason?